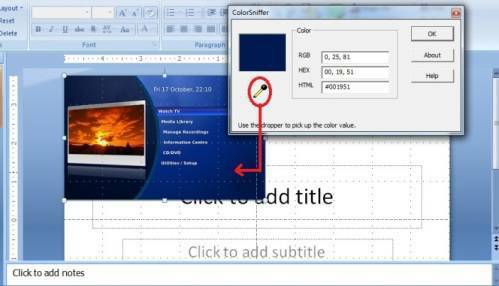 Using powerpoint sometimes need us to match color, the problem is when we use our eyes that cannot perfectly match. Even we say it same, but actually it does not match, so we need tool that can match color. Introduce a color sniffer to solve that problem. Use this tool is very simple, you drag the dropper by your cursor to the color that you want to match. after that it will show you code of color in 3 way, RGB HEX and also HTML. i often use RGB to match that color. 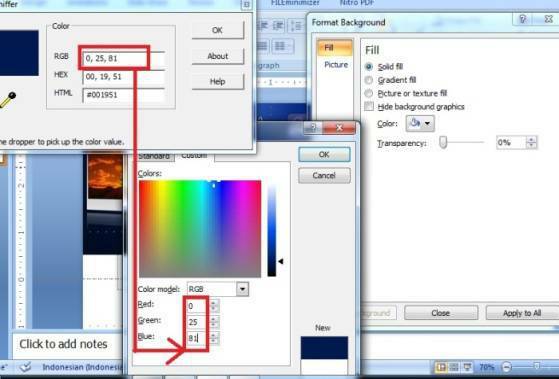 For example i want to make background powerpoint from picture, to match that color code i use this color sniffer to get the code. i get RGB 0,25,81. And than i open format background >> fill >> color>> more color, on custom tab i fill that code to RGB, next step is you choose ok. you will get the perfect color that match with picture. Really simple isn't it? you just download this color sniffer and try by your self. If you confuse because my english is bad, you can watch this video and you will understand. Thanks.